The LA premiere screening with live music that salutes the legacy of American composer, artist, writer and activist Lou Harrison (1917–2003), who forged a new course for 20th-century music with hauntingly beautiful pieces using Western, Eastern and custom-made instruments inspired by the Javanese gamelan and the Chinese zheng. 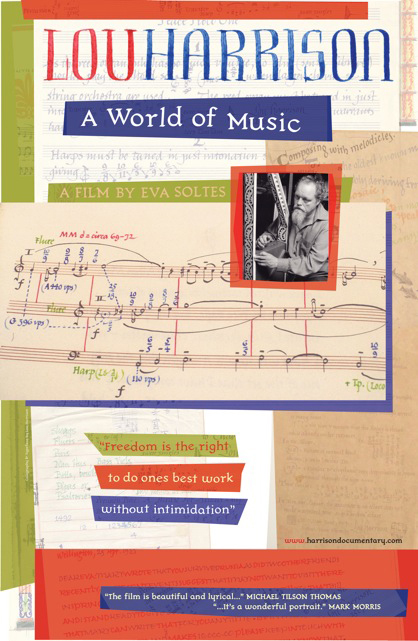 Directed by filmmaker and music producer Eva Soltes, Lou Harrison: A World of Music is a feature-length documentary drawn from more than 25 years and 300 hours of performances, rehearsals and interviews conducted with Harrison, his contemporaries and his life partner William Colvig. Before the film, a rare performance of Lou’s sumptuous Suite for Violin and American Gamelan (1973) – performed on Old Granddad, brought especially from Santa Cruz for this one-night only event.